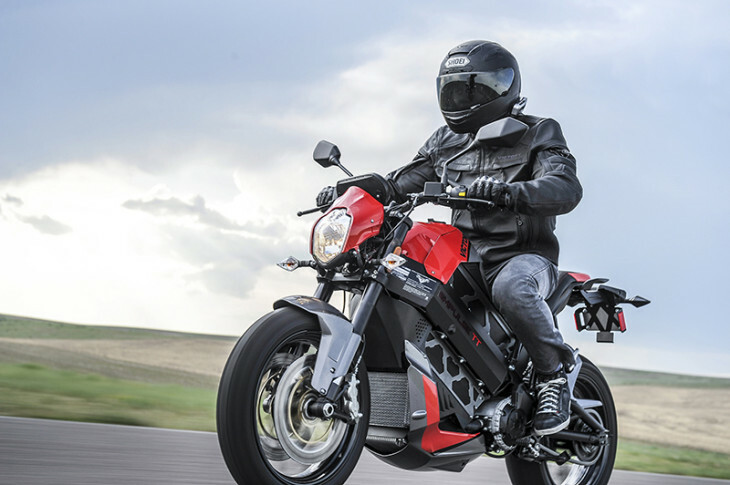 Building on its acquisition of certain assets from Brammo (see our test of the 2013 Brammo Empulse R here), Victory has announced it will put into production the Empulse TT (pictured) as a 2016 model. 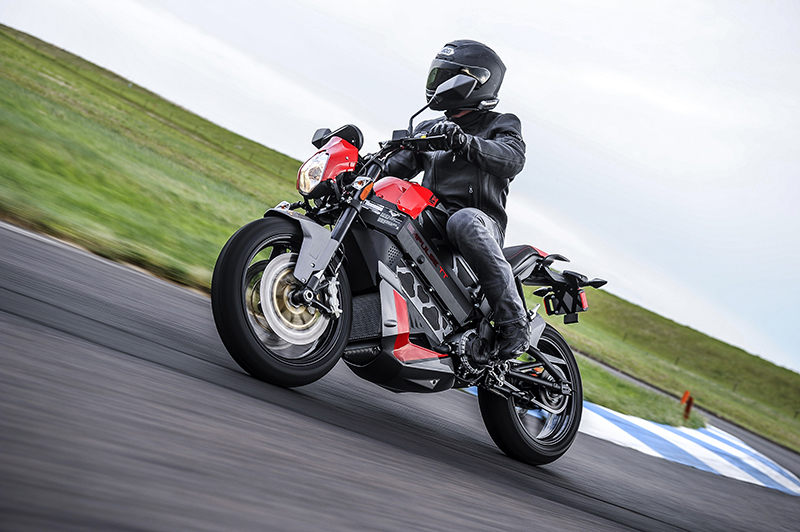 The Empulse TT follows Victory’s participation in the Isle of Man TT earlier this year with an electric bike. Here is the full press release from Victory, followed by specifications for the Empulse TT, which should be available for purchase in the U.S. later this year. 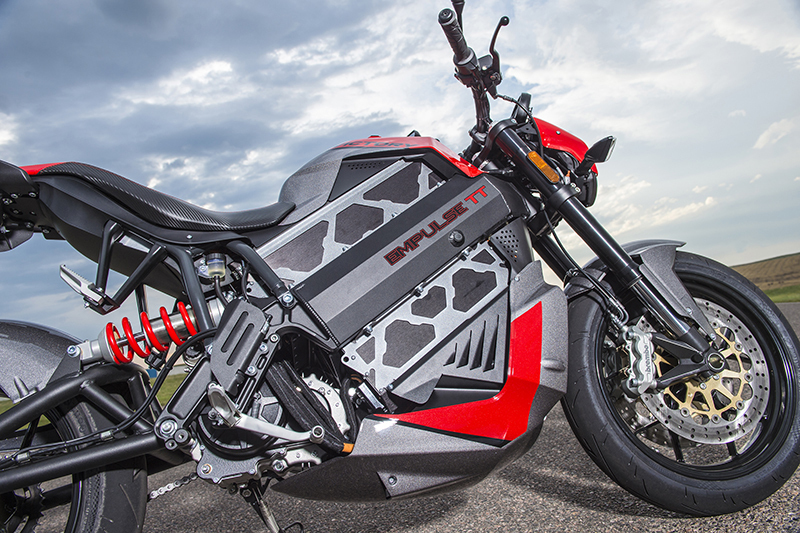 Medina MN, July 28th – Building on the innovative design and engineering that produced the fastest U.S. electric motorcycle at the 2015 Isle of Man TT Zero race, Victory Motorcycles has introduced the 2016 Empulse TT, the first all-electric addition to the Victory lineup. 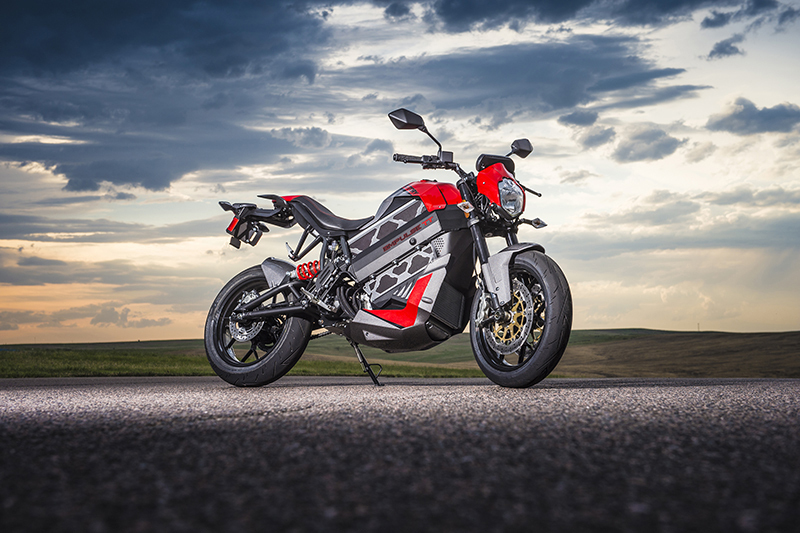 The Victory Empulse TT is a fully electric street-legal sport bike that is as capable of carving tight lines on twisting roads as it is powering the daily commute. 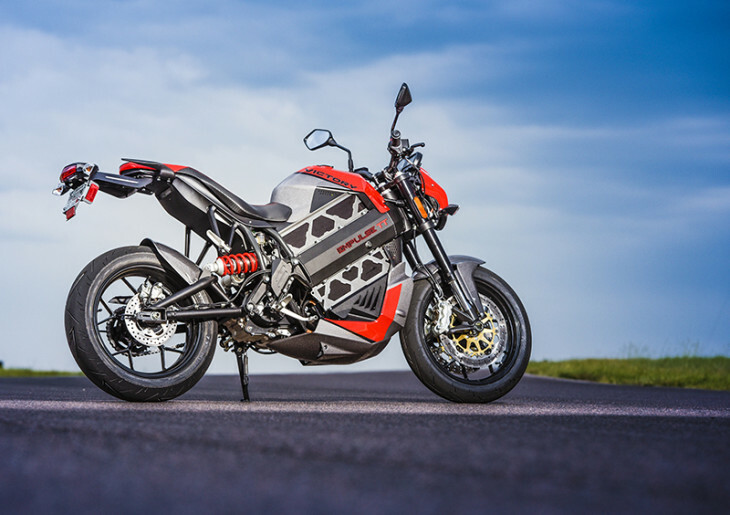 Building on Victory Motorcycle’s focus on performance, the Empulse TT features a sport bike-style aluminum beam-frame, an adjustable suspension, and aggressive brakes. With a combination of advanced technology and stylish, modern design, this unique new motorcycle delivers outstanding overall performance, zero-emission output, and a torquey motor. The 65 mile range is a complete show stopper. Another in a continuous stream of low mileage bikes that will never sell. Exactly. 65 miles? even at 100 miles its not even close to a usable vehicle. This is stupid beyond words. Call me when your little electric toys and run all day, or at least recharge while I eat lunch. Until then… this is a waste of time and money. That’s 65 miles when the batteries are brand spanking new. What will the range be a couple years later after you’ve put 20,000 miles on them? There was a guy racing one at RA that charged his with panels on his trailer. Does the rider get affected by that electric current running beneath them? Looks like a nice rig. I’ve heard good things about riding one. Have to test one when I get a chance. Victory dealer up the road. I just hope they have one at Biketoberfest I can demo ride. It’s a well known fact that I’m an empulsive buyer. As a typical American, marketing will eventually wear me down on electric bikes. I would like to ride one, but that is risky, its how I ended up with a Ducati years ago. Like others, the biggest barriers for me are ride time, charge time and price. The range is only good enough for going out to breakfast or the store. A lot of folks would be pushing the limits just to commute on one of these, unless your employer gives you free electricity for a charge. When we go for a ride, it is almost always 100 miles, it just takes that much distance to get in a good ride. I’ll be waiting for better batteries. This bike is a prime example of the conundrum that a would-be E-motorcycle maker faces. The “ideal” electric application would be an urban/scooter type of bike since today electric moto gets better range in the city and the average American drives 30 miles/day. The problem is, that product won’t attract customers so they need to sell to “motorcyclists”, who demand more range and performance than they’re currently offering. Better batteries will help, but a gallon of gasoline has always produced the same BTU as it does today. Point being, the battery is not the only opportunity. I wish I had the dosh to be an early adopter. I really like this bike, both in terms of it look and performance, but the range, recharge and price are simply untenable for me. I know, same thing everyone gripes about, but there has to be a better way. Heck, if it only the price were reasonable I could commute on it and range/recharge wouldn’t be an issue. If I can get a 600hp Tesla for $60k, why should I pay 1/3 the money for 1/10 the machine? You won’t get a current Tesla for 60K. It might have that listed as a starting price, but I don’t think anybody gets a starting Tesla. By the time you get what most want on them, you’re talking 90-100K a far cry from 60. However, 20K for an electric bike I will agree is more than what most will go for. Wonderful! Glad to see Victory enter the electric market with such a good looking bike. Now we should all know the path that Victory is taking since re-introducing the Indian motorcycle. Now all we can do is hope that someday sooner than later, the electric bikes will be at least more affordable and I’m sure more range. Maybe Tesla’s gigafactory will help with the afforable part. What do you know, a coal powered motorcycle! Most of the hydro power in the northwest is federally owned and goes to rural electric cooperatives. So chances are if you live in a city in Oregon you would be riding a coal powered bike just like the rest of us. Apparently in Wayne’s world, 100% of our electricity comes from coal. Otherwise he could have conceded that this bike is only partially coal powered, rather than referring to it as a “coal powered bike”. It seems the facts are that, on average, coal is around 1/3 of the total power sources of US electricity. We can get all nit-picky and say that in a certain part of Oregon one might get a higher percentage of his electricity from coal, but that’s really not the same as saying the bike is simply “coal powered”. I did some more digging and it turns out that about 85% of my juice comes from the BPA Hydro, with the most of the remainder from nuclear. Don’t get me wrong, I’m not all sappy for electric vehicles, but a blanket statement that the bike is simply “coal powered” seems a bit off to me. Where I live, it would a 100% natural gas powered vehicle. All the generation is interconnected so all the generated electricity goes to the grid and you take it off the grid. You use the same mix as is on the grid. If your local utility is 100% natural gas fired generation then more local demand (an additional electric bike for example) means more natural gas generation on the grid. And it also means that you would be paying rates based on natural gas only and not the grid average even though you are not using only natural gas generated electricity. The same is true for Oregon. An increase in demand would mean more generation from the local utility responsible for that load. But chances are that it will not mean a increase in hydro generation since they serve RECs and their generation is adjusted up or down in response to REC load primarily. Damn, Wayne. Way to through a wet blanket over our eco-fantasies! Wayne, good info and all true. Exactly how much coal constitutes “1 tankful” of power on this motorcycle? 1.05 pounds of coal = 1kw/hour. Battery capacity =10.4 kw/hour, so “1 tankful” would be 15.6 pounds of coal. Wow that’s a staggering figure to me. Put in perspective, 1 gallon of petroleum fuel produces 13.8 kwh, or .07gal/1kwh. Coal is just *that* cheap. How about the range, life expectancy of the battery, battery warranty, and of course, what is the cost of the battery replacement, if and when you should need one? Now lets see that Pikes Peak bike in production. Does anyone know if it harms the batteries to plug it in wherever you stop for as long as you stop over the long term? Can you pull that stunt if you do some sort of periodic discharge and charge ritual? Older battery types, such as NiCad and Ni-MH, developed a memory effect, and performed poorly if not completely discharged on a regular basis. Your garden tools and electric tooth brush probably still use this type of battery. However, Li-ion batteries are the exact opposite, and you should avoid running them down completely. This is true of your mobile phone; if you run the battery down to near zero on a regular basis, your phone battery will die much sooner. The Tesla electric car is designed to never allow the batteries to completely discharge to prolong battery life. If you buy the Victory Empulse, charge it as often as you can, and avoid running it until it is completely dead. Lithium batteries can be put back on charge at any time just as long as they are not overcharged and get too hot. This is controlled by the charging system so there’s nothing else needed from the user. A good charging system for lithium batteries will never actually charge them to 100% for that reason. Likewise, batteries are kept from discharging below about 30% as doing so will likely cause premature failure. Keeping lithium batteries in their sweet spot, between about 30% and 90% charge, they can live a long and happy life. I know many folks can’t afford to be early users of this technology, but I’m glad a major corporation has stepped up to the plate. I hope I get a chance to try one! Beautiful bike indeed. I like the paint scheme. Can’t wait till the day that electric bikes can go as far as 200 mile range for one battery charge. Definitely it will get there. so, in a nutshell, this is the first electric non-scooter motorcycle released by a major manufacturer? A production motorcycle from a major US motorcycle manufacturer, AND it’s not a cruiser. Now that’s news. Way to go Victory! Glad to see they are trying something other than cruisers. A good sign to see Victory stamping its name on the old Brammo without cruiserizing it. This gives me hope that there are some exciting things to come from Victory. Great job Victory I am glad to see that you are taking risk’s and starting to get into different styles of bikes including sport bikes (project 156) instead of continuing to make the same old stuff year after year like the so called motor company does.